The most successful photo shoots happen because everyone has done their preparation before the shoot. If you would like to shoot more than 10 items, it is very helpful to have a shot list. The items can be listed by set or by order of importance. By having a shot list in Google Drive we can collaborate and plan what is needed to make your photos look their very best. We also won’t forget to photograph something. I always advise clients to make a Pinterest board with photos that have their desired look. Every client has an image in their mind of how they want their product to look. It helps when all stakeholders know and agree on the look before the day of the shoot. Maybe your look is dark and cinematic or maybe it has a lot of white or it could have a set of saturated colors. Let’s discover it! It helps if you and your partners and colleagues agree before we start. Branding is always important. By developing a mood board and planning your shots, your branding will come shining through! Props, products, and lighting are all equally important when it comes to making a brilliant shot. By developing a look ahead of time we are able to curate the props and products so they are ready for the shoot. Time can be spent tweaking the set and making the perfect light instead of running madly around looking for more props! I always suggest ModelMayhem.com if you want to hire local models for a great price. I have model releases and guidelines to help find and manage the talent. Styling food and products for the camera is my forte. I am also happy to collaborate with stylists, creative directors, graphic designers, marketing teams, artists, and chefs. The chef should wait to plate the food until we have the initial shot and it’s best to talk about how to plate it for the desired look. By developing a mood board, shot list, and prop list we can ensure a great style for your shots. If we are shooting products it is essential that they arrive to the studio in pristine condition. We will clean them right before the shoot. The studio or location should have neutral-colored walls. The location doesn’t have to have natural light but that is always welcome. It does take time to set the lights and capture the look so everyone likes it. Once we have our set the way everyone wants, the entire day always rolls fast and smooth. Here is a successful shoot where the client was able to communicate that they wanted their product on white with no shadows. Their vision and unique selling point for this fish sauce is that it is the color of maple syrup. Care was taken with lighting to maintain the accurate color of the sauce while rendering beautiful reflections on their bottles. The client did their homework to ensure we had sample photos ahead of the shoot and they took the time to make a great selection of products in containers that were in pristine condition. They were also available the day of the shoot to provide valuable feedback for how to order the products. Here is another shoot that was not only successful but very smooth because we had a very specific look, prop list, shot list, styling, and great team. When I walked on the set everything was there and in order. All stakeholders had agreed on the colors, the items, and the look ahead of time. This bread bakery did a stellar job to prepare for a multi-day catalog shoot. They thought about the look that they wanted which was all white. They had everything organized and ready including all of the props. Someone who was familiar with the products was there to help identify everything. And the key stakeholders were on the premises to provide their valuable feedback. The photos were used in a print catalog and on a website. This entry was posted in News and tagged food photographer, food photography, food shoots, product photography, shoot organizer on by Judy. Expression Food Owner and Photographer, Judy Doherty, styled and photographed the front cover and the Perfect Pairings page for the holiday edition of Caviar Affair Magazine. The cover photo features gorgeous, sparkling Saint-Louis Crystal, Swarovski Crystal, Ketel One Vodka, and Paramount Imperial Osetra Caviar. This still life shot was done in the Expression Food studio. The Perfect Pairing page features a recipe and photo created and styled by Judy for the Ayate Anejo Tequila. This shot was also created in the Expression Food studio. It was an honor to work with the design team for Caviar Affair Magazine! Judy researched that the best food to pair with this sipping tequila is citrus and seafood and since the agave for the tequila is grown near Jalisco, the obvious choice is a delicious ceviche made with citrus, tuna, chiles, and prawns. It is all topped with Paramount Caviar. The caramel flavor of the aged sipping tequila pairs beautifully with the succulent seafood and blend of citrus flavors that are all brought together with a little heat and spice from the fresh chili peppers. This entry was posted in News and tagged Caviar, Caviar Affair Magazine, Editorial Food Assignment, Food Photography Bay Area, Pairing, Recipe Development on by Judy. One of the things I enjoy the most about my work is styling the food and dishes. I have found that my clients really value this creative vision and service. Recently my work has had so much creative opportunity. I created a ton of recipes for Partner’s Crackers for their marketing department. Here are a few favorites and you can see more here with the recipe cards that were created. I have been busy with a lot of new work and have updated my portfolio. Further it has a whole new look and organization structure thank you to the expertise of Molly Glynn at Wonderful Machine! This entry was posted in News and tagged branding, food photography, food product photography, food styling, new work, product recipe development, recipe, recipe creation on by Judy. Wildflour Bakery and Cafe in Agoura Hills, CA, asked me to shoot their entire catalog of beautiful artisan rolls and breads. The owners have a lot of pride in their work and I feel very honored to have captured it as their photographer. I styled and photographed the breads on location at their bakery. Wildflour supplies high-quality breads, rolls, sandwich loaves, breakfast pastries, Challah, and French bread baguettes to Trader Joe’s, Four Seasons Hotel, along with their own Wildflour Bakery Cafe, and many restaurants in Los Angeles. The owner wanted his breads and rolls to show the unique artisan style and high quality. We chose a white look so that the products would really stand out and have a cohesive look for the website and print catalog. This entry was posted in News and tagged bakery, Bay Area, catalog, food photographer, food photography, LA, Restaurant photographer, white, Wildflour Bakery on by Judy. Grill Spot Restaurant in San Francisco decided to show off their fine Japanese style tapas menu items in their window. I shot their menu along with a hero shot of the customer’s favorite dishes. The goal for the poster was to show off their fine menu and grab hungry patrons walking along the busy city street. We decided to make the 48”x36” poster double sided. The food hero shot faces out to the street with the byline, “A wonderful selection of meats, sauces, and Japanese tapas created for your eating pleasure!” This shows off the wonderful variety of grilled items, tapas, and ramen that is offered on the menu. The back side to the poster is a photo that I took of their beautiful fireplace that dances and warms the atmosphere of the dining room. It adds ambience and branding to the dining room. The result? The kitchen has more orders for the dishes on the poster! This entry was posted in News and tagged Bay Area, catalog, dark and dramatic, food photographer, food photography, Grill Spot photos, hero shot, LA, Restaurant photographer, restaurant San Francisco on by Judy. Sammy G’s Pizza should be a textbook example of a restaurant that does so many things right! Their first big success is correct and successful concept for location. They are near SJSU in San Jose and have a total fun menu and appeal for college students. The big outdoor patio is a fun gathering place! But they don’t stop there! The titles and varieties of the pizzas are second to none! Mother Cluckers is a BBQ chicken pizza while Bahn Mi Love features Vietnamese ingredients. Farmers Market pizza with fresh veggies was my favorite! And there is a breakfast section with eggs on pizzas called Wakey Bakey to capture the same customers for another meal period! Plus they have invented totchos, which are potato tot nachos. And their buffalo wings have crispy carrots in the little fryer basket that serves them. This is so simple but a very great presentation! They also have daily specials that rotate through their menu and are posted up front. An LED panel shows photos throughout the business hours. Their pizza box that is used for all to go and delivery app orders has their branding and URL. Bravo! No wonder they are busy with a great Yelp score! This entry was posted in News and tagged food photography, good restaurants, marketing, Restaurant photographer on by Judy. Everyone wants to know, why can’t I use my iPhone for my food shots? Why do you need an expensive big camera or a food photographer? You can use your iPhone of course. And it is a good way to go if you do not have the budget for a big camera or the time to learn how to use it or the money to hire a professional food photographer right now. The biggest differences between the two cameras, DSLR and iPhone, involve the options at your fingertips for off camera light, lenses, and large raw files. Off-camera light in the form of a flash or strobe with a light modifier to soften the light can be controlled to provide a beautiful raking light across the food, which gives it a dramatic look and bright accurate colors. This gives the finished photo depth and an aesthetic quality that captures and holds the eye. The flash and strobe are the same “kelvin color” as natural light so they render food colors in a very appetizing and natural manner. No green eggs and ham here! The iphone has an on-camera flash which is very harsh on food or just about any subject that is too close to it. Even if you are using natural light or ambient light you will want to add filler light for more depth or a more cinematic look. There are companies working on an off-camera flash for an iphone now so you can search for one. The lenses on a DSLR camera are very versatile and come in a variety of sizes and styles. The prime lenses, which I use, provide a lot of details which are important for food plus you can use a variety of apertures for selective focus. You can have just the foreground in focus or you can have it all in focus. Plus a DSLR camera can be set to record a “raw file” which allows you to more effectively edit the final photo by removing shadows, adding highlights and increasing certain colors. The iphone will record a raw file if you use a third party app to do it. But the DSLR produces a much higher resolution file that is very large and 50 meg so this is an excellent choice if you are printing. Make sure everything is clean and remove clutter from the background. All good shots start with great styling to complement the subject, your food. Use complementary colors like red and green wherever possible. Place your food in a window in natural light and shoot at various angles. It is better to have filtered light versus direct sun. A smart phone photo will always look better when you have good light. Focus on the food itself (press the screen so the subject is in focus). Make sure you are at a distance where the food is in focus. Closer is better but you do not want to be too close. If you opt to have the food fill about half of the image that is a great start. Edit the image in your iphone to crop and adjust the exposure as needed. Avoid using the flash wherever possible unless you are outdoors and a little farther away. This entry was posted in News and tagged dslr, food photography, iphone, iphone for food photography on by Judy. 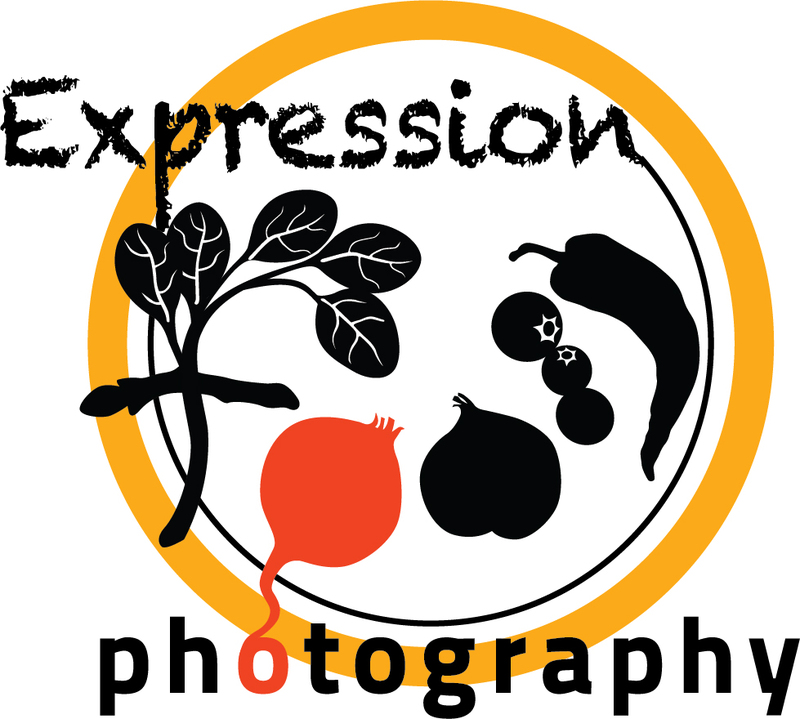 Expression Food is proud to expand services to include graphic design and printing specifically for restaurants and food companies. Our customers want to convert their photos that we have taken for them into wall decals, posters, window graphics, photo slideshows for LED flat panel monitors, menu boards, floor decals, banners, and much more. So we expanded our services to make their life easier! They can rest assured that they are getting a great design, affordable printing, and a high quality printed product very fast. We can design all of your in-house marketing and display items and have them delivered right to your door. All you have to do is choose and approve the designs we email to you. And you are done! We do all of the work and your printed items arrive on your doorstep very fast. We have vetted several designers and U.S. printing facilities that print all of these materials at wholesale prices and deliver 100% quality every time on time. It takes years to find these vendors and to develop working relationships with them along with an understanding of how to design materials for fantastic printed results! And we have done that successfully for years in the education market. Let us do this work for you! This entry was posted in News and tagged decals for menus, food photography, food photos, graphic design for restaurants, menu boards, signs for restaurants on by Judy. When I went to school at the Culinary Institute of America in Hyde Park, NY, to become a chef, I took a part time job assisting the CIA’s food photographer. The projects for cookbooks, posters, marketing materials, and stock photography were all endless and amazing. My first lesson about a camera was on a medium format Hasselblad. I worked long and hard to style shots and marveled at the beautiful light from the strobes. After I graduated, I became a pastry chef with Hyatt Hotels and Resorts, and I kept photographing for myself to build a professional portfolio. I admired his dishes because they have the aura of a chef’s hand and spirit with hand-chopped vegetables, herbs, and swirls of a simple sauce. I styled his food using his favorite ingredients. And when I showed him the photos in the back of my camera, his face lit up like a kid’s at Christmas and he said, “muchos gracias! !” (por nada!) So I was hooked because I felt that I made a difference in his life and business. I still feel that way on every job. This entry was posted in News and tagged about us, food photography, restaurant photography, story on by Judy. The goal of every one of our photo sessions is to make every detail so perfect that you do not need to retouch. There is nothing like outputting the perfect shot with little effort. It is easier for us, cheaper for the client, and the image makes us all so happy when it pops! The motto is always the same, “do not PLAN to PhotoShop.” It takes more time to photoshop a splatter of gravy off of a plate than it does to change or wipe the plate. The aspects of every photo shoot that can be controlled are composition, light, style, and neatness. Neatness can never be over-stated. We keep cloths for little spills and encourage and use gloves to avoid fingerprints on glass surfaces. Any surface that is shiny has to have extra care. And black plates also have to have extra care because while they are beautiful they often show every scratch and spill. But sometimes there are things out of everyone’s control that are not perfect. Like an exit sign over a beautiful table or a big metal oven bar that doesn’t look right next to a golden roasted chicken in a rotisserie oven shot. Some windows cannot be cleaned on site because no one can reach them and they did not think to call the cleaner. And metal always looks old unless it is brand new. Glass gets extra reflection marks because we cannot use polarization film on every light source. Takeout bags or containers sometimes have tiny dents or wrinkles and they need a little smoothing. The chicken was roasted perfectly but one of the drumsticks is missing a patch of skin. You filled all 15 of the beer glasses to show off your new IPA beer bar and the colors are gorgeous in the frosted glasses but just one of the glasses has a fingerprint near the bottom and no one saw it. Such is the life of working on location in a live restaurant! We have fixed all of these easily! We have you covered. It is good to know that our retouching skills for food are stellar so when they are needed in situations like these so you will have your very best shot! This entry was posted in News and tagged food photo packages, food photography, packages for social media, restaurant photography, retouching, retouching food photos on by Judy.